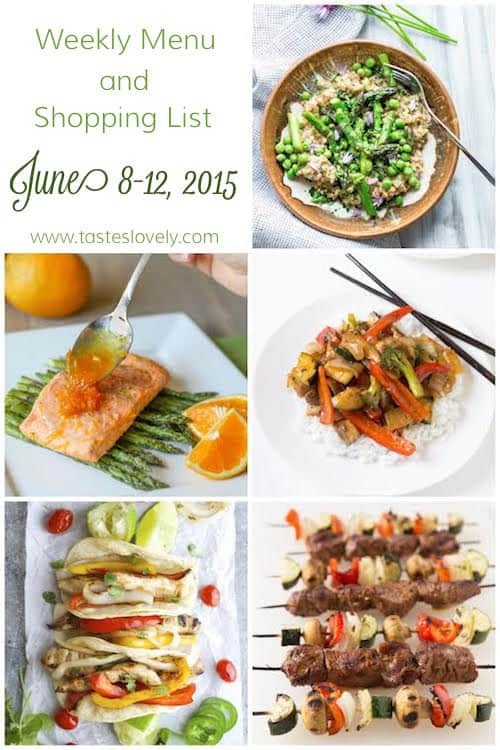 Weeknight dinner meal plan and grocery shopping list for the week of June 8-12, 2015. 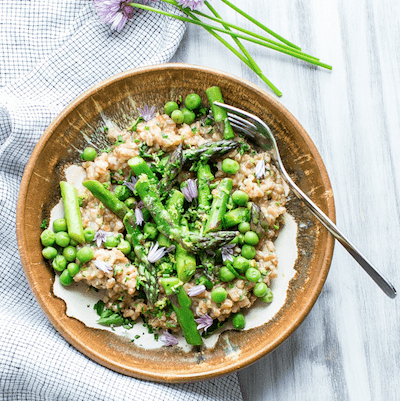 Creamy Farro with Pesto Asparagus and Peas // A creamy farro with all the best produce of spring. Ready in 35 minutes! 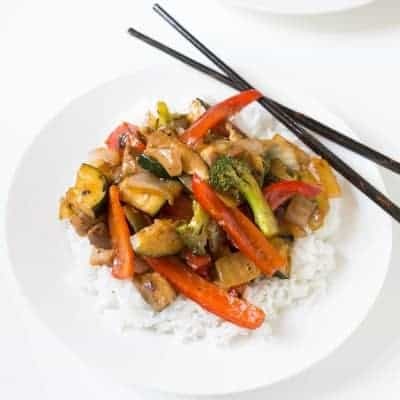 Broccoli and Bell Pepper Chicken Stir Fry served with white rice // A healthy and delicious vegetable and chicken stir fry, made using the best homemade ginger garlic stir fry sauce. 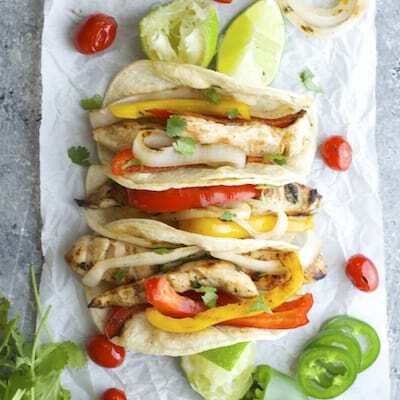 Jalapeno Lime Chicken Fajitas // Flavorful jalapeno lime marinated chicken and grilled vegetable fajitas. Remember to prep the chicken marinade the night before, and allow it to marinate in the fridge overnight. 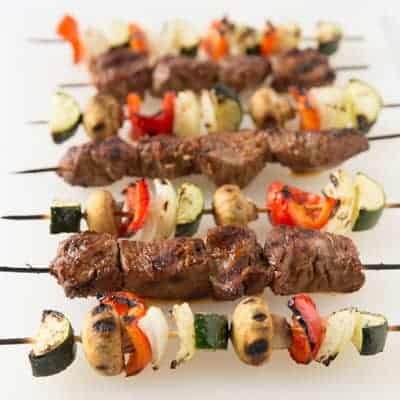 Grilled steak and vegetable kabobs served with steakhouse style baked potatoes // The steak is marinated in a delicious asian style marinade. Served with grilled vegetable kabobs, and the best steakhouse style baked potatoes. Remember to make the marinade the day before and marinate the meat overnight. Double the recipe to serve 4 people. 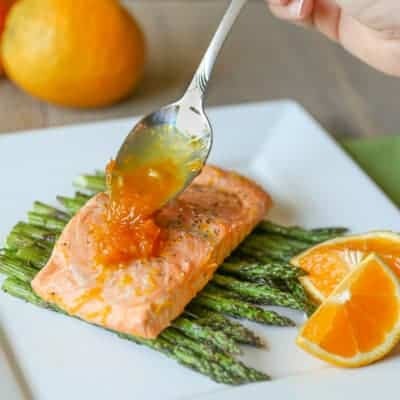 Make the orange maple marinade for the salmon, marinate the salmon in plastic bag until ready to cook on Tuesday. Make the stir fry sauce. Refrigerate in an airtight container. Make the white rice for the stir fry. Refrigerate in an airtight container. Microwave for 5 minutes then fluff with a fork when ready to serve. Love the asparagus you’ve included in this week’s meal plan! Thank you for including my Farro dish, Natalie! This looks like another perfect menu, Natalie! 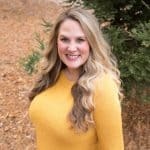 I love your prep tips to do on Sunday! And those kabobs are just calling my name. My husband would love to grill those babies…yum! Lovin’ what’s on the menu this week, Natalie! I have GOT to add that grilled salmon to my menu! That orange glaze looks like heaven! This week’s menu looks fantastic, Natalie! I’m loving how colorful and fresh everything looks! 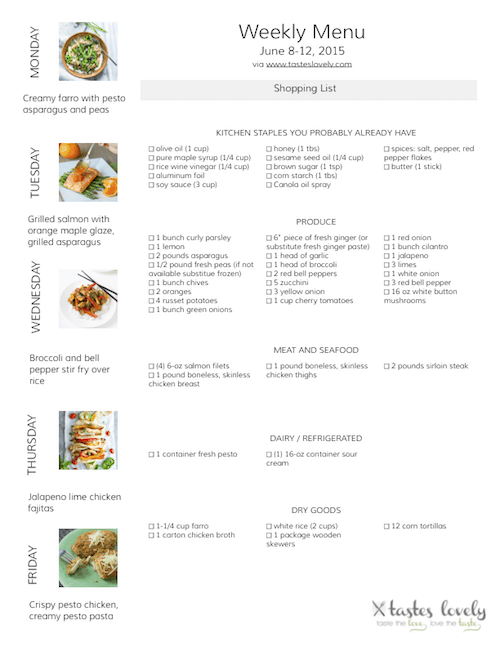 Your prepping tips and shopping list are seriously the best! What great ideas here! Love that you put this together for everyone!